If you live in Oldham and are looking for local TV or satellite installation and repair experts, then call The Aerial Guys. We are passionate about providing you with the best possible service. Contact us today on 0161 3272687 to book an appointment. The Aerial Guys are a TV aerial company that possess a vast amount of experience in the diagnosis of poor TV reception and the implementation of the solutions required to provide a better picture. If you’re experiencing picture quality issues when watching your favourite TV programmes, we can provide you with the solution that will transform your viewing experience. From professional TV aerial installation in Oldham to aerial alignment in Oldham, our services are designed to provide you with a range of options that are capable of meeting your individual requirements. Increase your TV viewing enjoyment by getting in touch with us to book a visit from your local aerial engineer in Oldham. The installation of a high quality TV aerial or satellite dish is required to gain access to many television services in the UK. As experienced aerial installers in Oldham, we can provide you with an external digital aerial which will allow you to access the broad range of Freeview channels that are available whilst improving the picture quality over your current setup. Our expertise in the installation of satellite dishes can also provide you with access to Freesat services as well as the installation and setup of a variety of Sky services such as Multiscreen and Sky Q. Whatever your preferences for watching television, contact us today so that we can provide you with the services you require. The Aerial Guys are experienced in providing solutions to a wide range of TV and satellite related signal problems through the provision of local TV aerial repairs in Oldham. We also specialise in helping you get the most from your TV equipment by performing a comprehensive setup procedure if you’ve purchased a new home entertainment system. 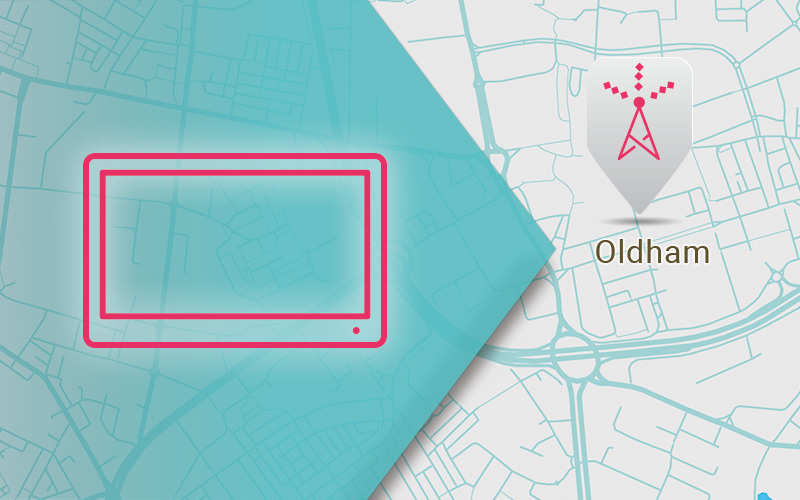 Take advantage of a new digital TV aerial in Oldham or our suite of television services by calling us today so that we can provide you with an overview of your options. We will dispatch an engineer to your property who will assess your existing setup before then providing you with a quotation for the services you require. Following a recent bout of bad weather, Shaun from Oldham noticed that his TV picture was becoming increasingly pixelated. “I thought it would sort itself out but after a few days it was still the same. In fact, I think it was getting worse. My wife was on at me all the time to get it sorted. So, in the end, I called The Aerial Guys. “I’d read that they were local but I hadn’t expected them to be quite so fast at getting to our place. They were there within the hour and sorted out the problem straight away. The cost was pretty reasonable too. The TV picture we get now is really clear, much better than it ever was to tell you the truth. The Aerial Guys really do know their stuff. I’m dead chuffed with them!” Shaun says.